Editor’s Note: We thought it would be fun for you REVOLTERS to see what it’s like to cover a music festival. 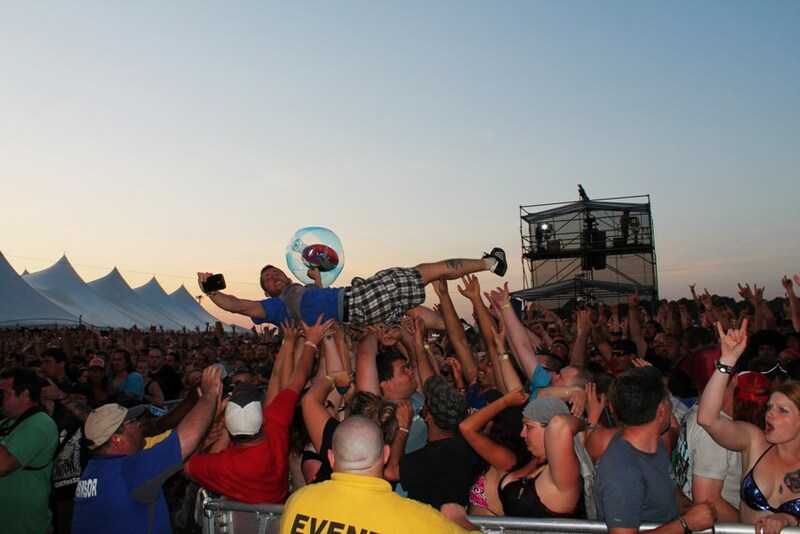 So, we trolled JP’s social media and pulled some of his personal pics to make this slide show of behind-the-scenes adventures that he had at Carolina Rebellion 2014! It appears that a great time was had by all! The review of the whole festival and links to Johnny’s amazing pics that he shot for RR are below. Enjoy! 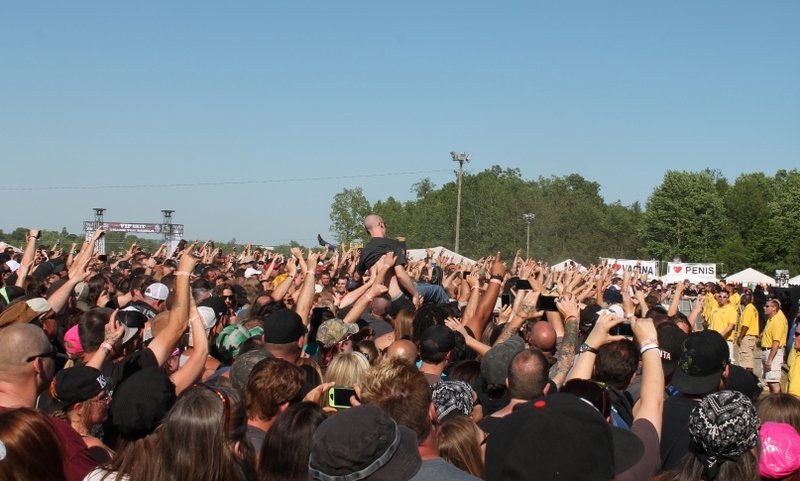 The month of May has become definitively known as the World’s Loudest Month and this year’s Carolina Rebellion did its part to make sure that held true. Mother Nature played the role of spoiler last year, as rain and unsafe conditions forced promoters to stop the show early on the second day. Well, it looks like Mother Nature wanted to make up for last year’s yucky conditions by gracing fans with blue skies and cool breezes – and she came ready to rock all weekend long! 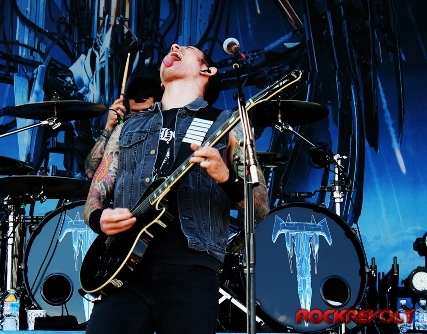 Matt Heafy of Trivium going “blahahahaha!” while ripping it up! This year’s record breaking event of 60,000+ took place on May 3 and 4 at the Charlotte Motor Speedway for the second year in a row. After three previous shows (at three different locations), this venue seems to be the best fit for an event of this size. As the gates opened and the huge sea of black t-shirts began to flow in for the show, you could feel the electricity in the air and just sense that it was going to be one hell of a rock n’ roll weekend! 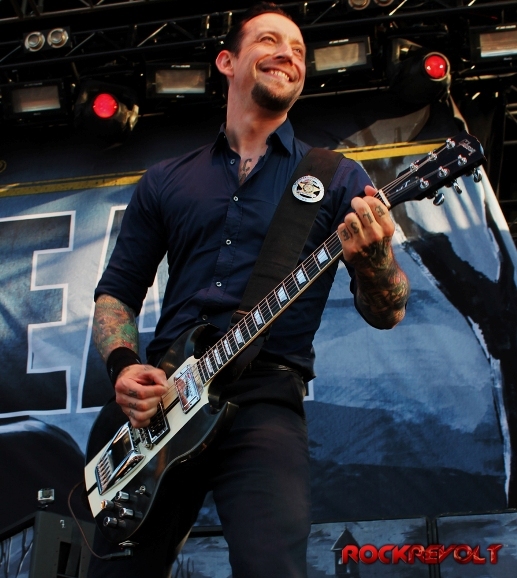 Michael Poulsen of Volbeat having a blast at CR! The crowd began to grow in size as the day progressed and it was quite massive by the time Volbeat took to the stage. Hailing from Denmark, with a touch of New York added via member Rob Caggiano, the band was a huge favorite by many in attendance. A surprise came when members of Anthrax joined the band for a song as wounds between Rob and his former band seem to have healed. Chris Jericho and Fozzy was the last to take the Jager stage as Jericho tried hard to change the crowd chants from Y2J to Fozzy. Jericho, who is usually an over-the-top performer and showman did not disappoint: sporting a leather jacket that lit up and changed colors ala’ Rhinestone Cowboy. Speaking of over the top performances, Rob Zombie closed out the Rebellion stage with a set packed full of Zombie staples, kicking it all off with a suprising cover of Grand Funk Railroad’s “We’re An American Band.” His performance was one that seemed to divide the crowd as many thought it was a bit lackluster, while others saw it as a solid delivery by Rob and the boys. Avenged Sevenfold closed out day one and it seemed as if not a single person had left as the crowd was simply massive – perhaps the biggest that A7X has ever seen (not sure about that), but you could tell they were loving it! Lead vocalist M. Shadows was seen smiling quite a few times during their set as the crowd’s strong reaction was definitely affecting him. The dual guitar attack of Synester Gates and Zacky Vengeance took center-stage many times as they riffed-out together side-by-side as huge flames erupted on the stage. Day One was a success and the crews immediately began cleaning up the litter-filled grounds because in less than twelve hours, it would be time to do it all again! 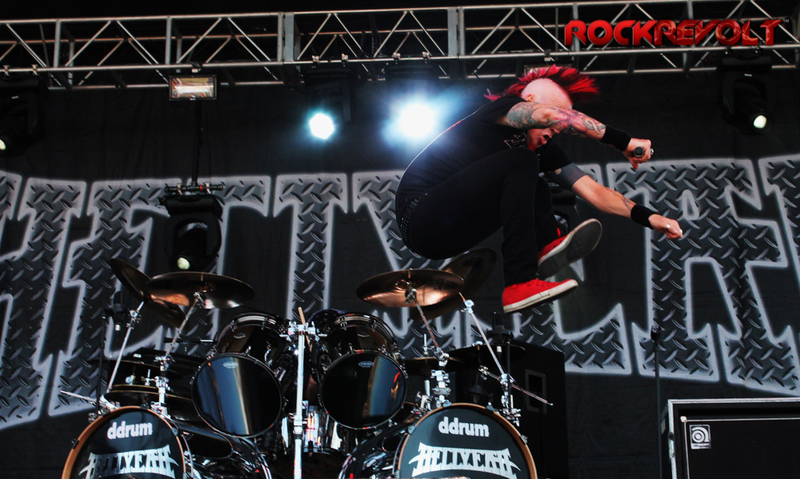 Chad Gray of Hell Yeah goes airborn! Day Two was kicked off by Gemini Syndrome on the Jager stage. The crowd turn-out for these guys rivaled that of some of the bands on the bigger stages over the course of the weekend. This was another band that was visibly moved by the response from their audience. Hellyeah kicked off the Carolina stage with a loud and rowdy set with lead singer Chad Gray sporting a Mohawk that was equally as loud. Another crowd favorite was Myles Kennedy and Alter Bridge who delivered a great set to thunderous approval from those watching. 311 delivered a bit of nostalgia to many of those in attendance who watched their performance. The band sounded tight and spot-on as their performance time warped many of us back to the 90s. Five Finger Death Punch, whom many in attendance felt should have headlined day two, closed out the Rebellion stage with a set that was perfection in the typical 5FDP fashion. Lead singer Ivan Moody has an uncanny knack for being able to wrap a crowd around his brass-knuckled fingers with relative ease. Their high energy set had the massive crowd chanting along in an almost borderline riot mode mixed with an insane amount of crowd surfing, but it just wouldn’t be a Death Punch show if there wasn’t some moshing and mayhem! Ivan even brought several young kids up on stage for part of one performance which was really cool. Kid Rock closed out the day and brought a huge dose of his unique brand of rap and pop/rock/metal to the stage that made believers out of quite a few doubters. Kid Rock knows how to deliver a huge party type of atmosphere show and he did just that. It also doesn’t hurt when you play songs at a huge rock show that sample RUSH’s “Tom Sawyer” and Metallica’s “Sad but True.” If you were part of the flock that left early…you missed one hell of a performance. Overall, I think it’s safe to say that the weekend was a huge success. Yes, there were some complaints but with a show this size, it’s expected. The food, beer and water do tend to be a bit expensive, but all outdoor shows, whether music or sports, tend to run the same way. I think the promoters would make a fortune if they had a vending machine that sold little tubes of sunblock at these events as many people there were looking like Larry the Lobster after day one. I’m pretty sure that before the grounds were completely clean that plans for Carolina Rebellion 2015 were already underway.